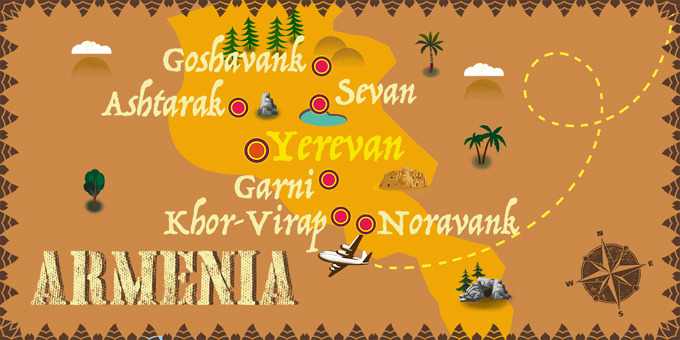 Explore the history, legends and legacy of Armenia. From the vibrant capital of Yerevan, uncover the past of Khor Virap and Noravanak Monastery and sample delicious local wines in the Areni Winery. Step into Pagan times at the Garni Temple, enjoy a trip to a lively fruit market and relax on the shores of glistening Lake Sevan, in the picturesque Dilijan region. All air taxes & fuel surcharge. One bottle of water per person per day. For the departure of June 1st the hotel will be Imperial Hotel or similar. For the departure of July 20th the hotel will be Silachi. For the departures of August 24th, September 7th and 21st, and October 5th the hotel will be Bass Boutique. ** Half board and full board available to book in the next step of the booking process. Arrive at your UK departure airport, ready for a flight to Yerevan. Arrive in the early hours into Yerevan, the capital of Armenia, filled with Soviet-era architecture and interesting museums. Transfer to the hotel and overnight stay in Yerevan. Breakfast at the hotel. Start the day with a city tour of the highlights of Yerevan. Begin in Republic Square, situated in the centre of the city and home to the History Museum and National Gallery, in front of the singing fountains. Head up Northern Avenue, the modern part of the city, linking the Republic Square with Freedom Square, to see the impressive building of the Opera and Ballet Theatre. Stop at the poignant Armenian Genocide memorial complex, before visiting Etchmiadzin, the founding church of the Armenian Apostolic Church and the holy seat of the Supreme Patriarch. As the tour comes to close, visit the ruins of Zvartnots, a temple constructed in the 7th century and partially destroyed in a huge earthquake 300 years later. Both Zvartnots temple and Etchmiadzin Cathedral are included on the UNESCO Cultural Heritage list. Return to the hotel and overnight stay in Yerevan. Breakfast at the hotel. Set off for the region of Ararat to visit the spectacular Khor Virap Monastery, where, according to legend, Christianity was adopted as the state religion, after the conversion of the King to Christianity by St. Gregory the Illuminator in the year 301. It is set in the shadow of mighty Mount Ararat and looks like something from a fairytale. Next, head to Noravanak Monastery. This UNESCO World Heritage Site, located deep within a narrow gorge, dug out by the Amaghu River, and surrounded by brick-red cliffs, is an astounding vision of an Armenian Monastery complex. Built in the 13th-century by the architect Momik, the complex is composed of a collection of churches and was once the residence of pious bishops in the 14th century. Finally, relax with a visit to Areni Winery, for some delicious Armenian wine tasting. Return to the hotel. Overnight stay in Yerevan. Breakfast at the hotel. Today, set off for the amazing Garni Pagan Temple, dating back to the 1st century AD and was dedicated to the sun god Mihr, it is the only Hellenistic temple left in the Caucasus. Admire its ionic columns and enjoy a glimpse into pre-Christian Armenia. Afterwards, head to Geghard Monastery, also known as Ayrivank, which means “church carved out from the rock”. The monastery was constructed in the 6th century and is listed as a UNESCO World Heritage site. Return Yerevan to visit the vibrant fruit market and try Armenian dried fruits. Overnight stay in Yerevan. After breakfast at the hotel, take the road to Lake Sevan, 70 kilometres from the capital Yerevan. Lake Sevan is the largest freshwater lake in the Caucasus. Upon arrival, you can climb the stairs to Sevanavank Monastery, founded by Gregory Illuminator in 305, to enjoy the views of the lake. Continue to Dilijan, also known as “Armenian Switzerland” due to its abundant nature, surrounded by dense forests and rocky mountains. Let yourself be enchanted by the stunning landscapes. The next stop is Goshavank Monastery, situated within the Dilijan National Park. Goshavank was one of the most famous religious, educational and cultural centres of the 12th and 13th centuries. Afterwards, visit a family house in Dilijan to learn how to make the traditional Armenian sweets, known as "Sujukh". Return to Yerevan. Overnight stay in Yerevan. Breakfast at the hotel. Today, head to Amberd Fortress, located on the foot of Mount Aragats. The 7th-century Amberd Fortress was the home of the Pahlavouni princes and is one of the only preserved feudal castles in Armenia. The name literally translates as "fortress in the clouds". Continue to the Armenian Alphabet Monument, built in 2005 in commemoration of the 1600th anniversary of the Armenian alphabet. Next, admire Saghmosavank Monastery, for its incredible views across the canyon. Return to Yerevan and spend the rest of the day at your leisure. Overnight stay in Yerevan. Breakfast at the hotel. Spend the day at your leisure, exploring the city's shops, sampling the unique Armenian cuisine or seeing the city's sights. Overnight stay in Yerevan. Breakfast at the hotel. At the indicated time, transfer to the airport for a flight back to the UK. Arrive in the UK and end your trip. A visa is mandatory. This can be obtained in the country, on arrival at the airport.